In the late ’50s, a blonde-headed doll named Barbie was introduced and quickly took over the world. While a massive audience of mostly little girls relished the world’s funnest new toy, savvy marketers wondered if they could recreate the success amongst their brothers. Enter: G.I. Joe. 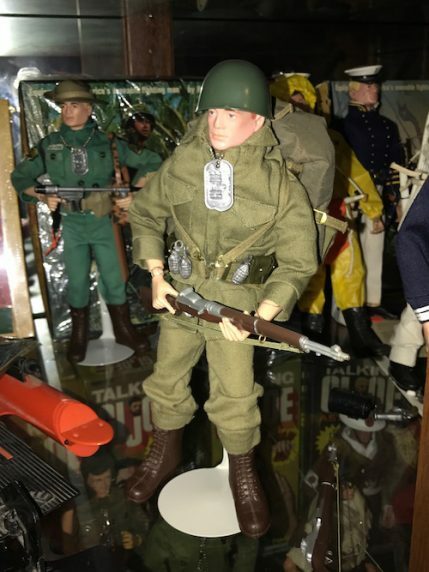 In 1964, the Hasbro toy company created an action-packed doll laced in military fatigue, ready to conquer any mission, and marketed to little boys. G.I. Joe quickly captured the hearts of many. “Before G.I. Joe, there were no action figures,” explains Brian Savage, founder of the GI Joe Collectors’ Club. “Or an action figure would be a 54-millimeter lead solider, or a plastic soldier.” G.I. Joe was a revolution in that he was posable; he could crouch and hold a rifle like a real soldier. “There was no category. Every action figure since the ’60s owes its beginnings to G.I. Joe,” says Savage. In the early ’50s, America was embroiled in the Korean War, and Army men were heroes. 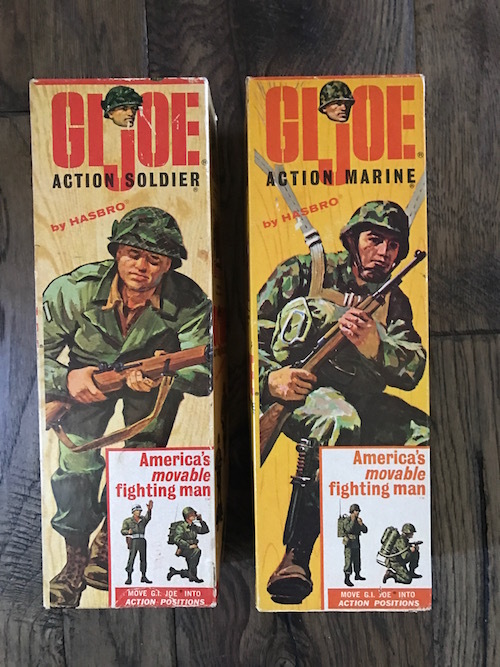 What’s more, the marketing team over at Hasbro consisted of veterans of both Korea and World War II. In hopes of securing the right look for G.I. 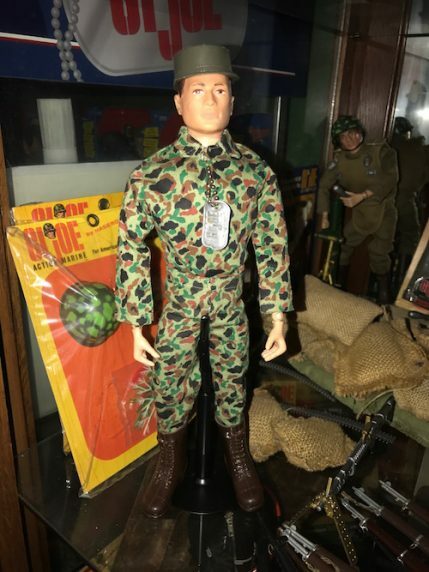 Joe, Hasbro took some camo-styled prints from the Marines to bolster the toy’s credibility, although the toy’s camo accessories only became accurate much later: “They never really did it back in the ’60s,” says Savage. “There never was like a tiger stripe Vietnam camo print, which is a famous one. They just took the basic Marines [gear], looked it and said, ‘That looks good.’ ” In the ’90s and ’00s, the 12” military figures became “very accurate to current military or whatever military they are trying to depict at the time,” says Savage. Soon Hasbro began pushing different accessories for G.I. Joe. “That was really the big deal, trying to get kids the variety of accessories and things that they could outfit their figures [with],” says Savage. Now you could dress G.I. 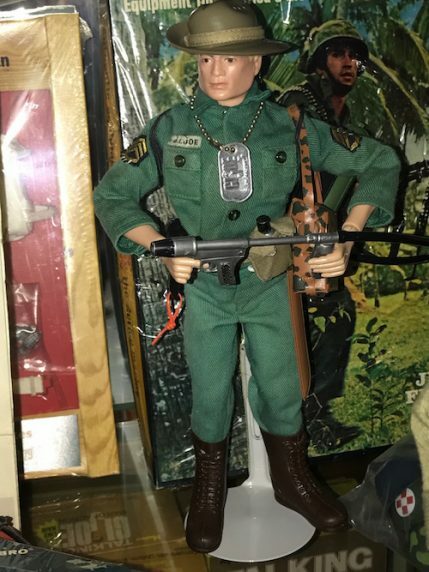 Joe “as a marine, a jungle fighter, a scuba diver, frog-man, a dressed pilot, or whatever that was and then you put those clothes on,” according to Savage. The personal attachment between kids and their toys grew significantly. With new G.I. Joes and accompanying accessories still coming out, 50 years later, Savage hopes that people will continue to cherish their G.I. Joes. But in a way that breaks the rules of grown-up toy collectors: Taking them out of the box and playing with them.